EUREKA! You've come to the right place for an engaging and rigorous challenge in the science classroom. 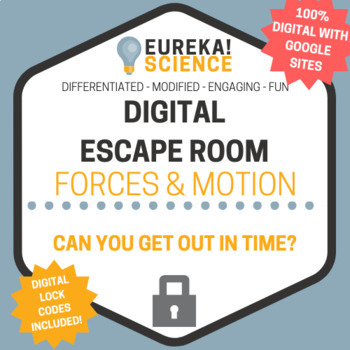 Save yourself time with this SETUP FREE, 100% DIGITAL ESCAPE ROOM! You will receive a LINK to a Google Site for a hassle free Escape Room Experience! Students race the clock to locate the Miss Velo City Pageant's stolen tiara in this Escape Room. Students will work collaboratively to decipher puzzles and codes while they apply their scientific understanding of forces and motion. This product is great for differentiation in a diverse classroom. It has rigorous and challenging puzzles, scaffolds and helpful hints for stumped groups. THANK YOU FOR YOUR INTEREST! FOLLOW MY TpT PAGE FOR MORE TO COME!